Reflection: 20th Sunday in Ordinary Time, – August 19, 2012. 20th Sunday in Ordinary Time, August 19, 2012. Readings are from Year B. The Gospel for this Sunday is John 6: 51-58. Continuing his discourse on Eucharist. Jesus, Word and Flesh: Remember how St. John’s Gospel began,- ‘In the beginning was the WORD, and the Word was with God, and the Word was God… The word became FLESH and dwelt amongst us, and we saw his glory, the glory that he has from the Father as the only Son of the Father, full of grace and truth.’ (See John Chapter 1). Jesus is ‘the WORD made FLESH’, dwelling still among his people who are now his own body, his own flesh and blood, – in other words, us. All of his humanity, his very ordinariness, is ‘for the life of the world’. ‘This is my body, broken for you…this is my blood, poured out for you’- his whole self, body, blood, soul and divinity, given for us and given to us in life and in the Eucharist, to be taken right into ourselves completely. ‘Whoever eats my flesh and drinks my blood lives in me and I live in that person.’ As Jesus draws life from the Father, so will we draw life from the Father, through Jesus. The Risen Lord, the Son of God who had become flesh, now becomes bread for us and drink for us, and makes his home within us if we welcome and receive him with open arms. 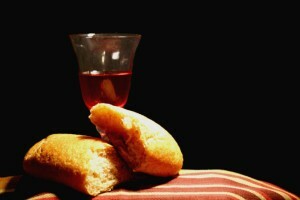 ‘Live in me, and let me live in you‘ (John 15:4) This is the extraordinary union that we call ‘communion’ with Jesus. It happens very particularly in ‘the breaking of Bread’, that is, Eucharist or Mass. As we said last week, ‘There are thirty layers to every story, and a Rabbi can only show you one layer.’ There’s eating and drinking in every word of Jesus, and in his whole person offered to our whole person in a holy communion. ← August 17th, 2012,- New Irish/Brazilian Redemptorist Mission to Africa.